It’s not often a resort golf course presents a hazard that could be life-threatening, but this is springtime and I’m playing in the Canadian Rockies, so I paused to read the white warning notice stamped to a fence post by the tee box on the 14th hole. says the poster, and I glance over my shoulder before reading that black and grizzly bears have been seen in the vicinity. It’s dated May 22, 2014. Three days ago. 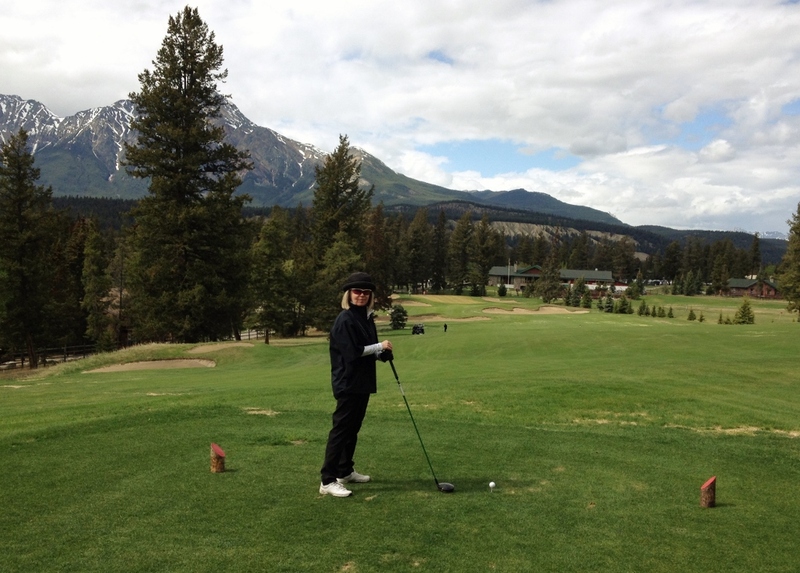 We’re on the back nine at the scenic Fairmont Jasper Park Golf Course in Alberta’s Rocky Mountains, about three hours west of Edmonton. The course was designed in 1925 and is still part of a wildlife corridor, home to elk, deer, caribou, moose, wolves, cougars, bighorn sheep, mountain goat and bears. There are about 300 black bears in this subalpine forest and 200 grizzlies in Jasper National Park, making it one of the largest protected populations of grizzlies in the world. It’s a typically cool and unsettled spring day, with a mix of sun and cloud and showers in the forecast, but I wasn’t going to miss playing at Canada’s #1 golf resort, according to SCOREGolf magazine. Locals say the mountain weather changes in minutes so my husband and I are dressed in layers and my rain gear is stuffed into my golf bag. This is one of the most attractive golf courses in Canada with snow-capped mountain views from every hole, but the only wildlife we saw was a family of deer trotting daintily across the fairway. Elk however, are plentiful around the Jasper townsite, and plenty dangerous in the spring when females will do anything to protect their calves. Sitting outside by the fire pit at the 19th hole, I ask our waitress if she has seen any bears on the course this year. “Oh yes, almost every day since early May,” she enthused, as most young seasonal staff tend to do when talking about this wild and beautiful mountain destination. May is when the bears come down to forage for food after hibernating at higher elevations all winter. “Which are the best holes for bear spotting?” I had asked the starter four hours earlier, but she neatly sidestepped the question, leaving me to figure out myself why holes 13 and 14 are completely fenced in with cattle crossing exits on the cart paths. “The 13th and 14th,” our waitress now confirms, adding that she regularly sees the same cinnamon-coloured momma bear and her two ‘cute’ baby bears on the 14th hole, which runs along Lac Beauvert. Apparently the common North American Black Bear can be blue-gray or blue-black, brown or cinnamon — even cream in colour. Black bears, which can weigh up to 270 kg (600 lbs), have smaller heads with pointed noses, tall ears and no shoulder hump. The Grizzly bear, a North American subspecies of the Brown bear, has a distinctive shoulder hump, larger head and flatter face with short rounded ears and claws as long as a human finger. A male grizzly can weight up to 390 kg (800 lbs) and can reach 2.5 meters (7 ft) when standing on hind legs. They can run up to 55 km/h (35 mph) and can smell food a mile away. Thank goodness these omnivores only eat grass and berries and fish and mammals.